Pearl River, NY – Kahr is proud to introduce the latest addition to their double-action micro-compact pistol product line – the Kahr CW380. The new .380 ACP caliber is substantially smaller than Kahr’s popular PM9, and because of the weight and diminutive size, it is an ideal concealed carry pistol. The CW380 pistol has a 2.58 inch barrel, an overall length of 4.96 inches and a height of just 3.9 inches. It weighs just 10.2 ounces without a magazine. The pistol has a black polymer frame and features 4140 steel inserts molded into the front and back of the frame for added rigidity. It has a machined, solid 416 matte stainless steel slide and a textured polymer grip. 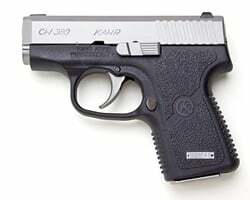 The Kahr CW380 features a lock breech, modified Browning type recoil lug, and utilizes Kahr’s seven patents including the “safe cam” action found in all Kahr pistols. The result is a micro-compact pistol with very little recoil and quick follow-up shots. The pistol features drift adjustable white bar-dot combat rear sight and pinned-in polymer front sight. Differences between the Kahr CW380 and Kahr P380 models include: the CW series has a conventional rifled barrel instead of the match grade polygonal barrel found on P models; the CW slide stop lever is MIM (metal-injection-molded) instead of machined; the CW series slide has fewer machining operations, and uses simple engraved markings instead of roll marking; the P380 comes with two magazines, but the CW series comes with one 6 rd steel magazine with flush baseplate. Lastly, the slide locks back after firing the last round – another feature missing on a number of other value-priced compact semi-auto pistols. The durability and reliability of the CW380 model makes it a strong consideration as a backup gun for law enforcement. The MSRP on the Kahr CW380 is $419.